Minecraft 1.9 the combat update is live, and with a new version comes a bunch of new items and blocks. We have collected all the new crafting recipes for you in this guide. 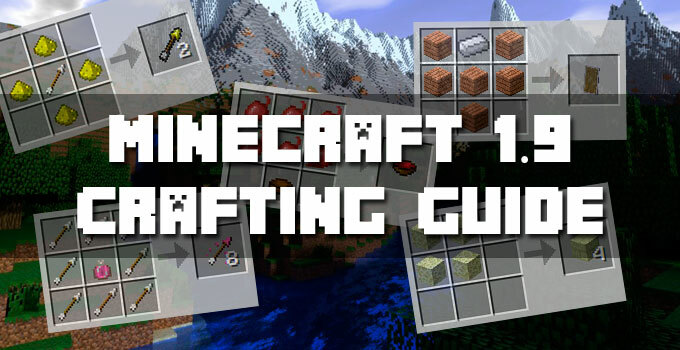 We have updated the crafting guide to include the new recipes. To craft a shield in Minecraft you will need: Any Wood Planks + Iron Ingot. The durability of two shields is added together, plus an extra 5% durability. Please note that the repaired shield has no pattern. To apply a banner to a shield, just place the shield and any banner in the crafting grid. This will apply the banner pattern to the shield. The banner is consumed in the process. The shield must not have any pattern to begin with. Applying a banner will repair the shield to full durability. Shields can’t be enchanted using an enchantment table, however an anvil can apply both Mending and Unbreaking to the shield. Purpur blocks and purpur pillars are decorative blocks, that are naturally generated in end city dungeons found in the End. Purpur blocks and pillars can be mined using any pickaxe. If mined without a pickaxe, it will not drop anything. Popped Chorus Fruits can be obtained by smelting chorus fruit. An End Rod is a decorative light source, that emits white particles. It can be obtained by any tool or block. Will be destroyed if run over by flowing water, just like torches. Ingredients: Blaze Rod + Popped Chorus Fruit. The primary purpose is to recharge the health of the ender dragon. As items end crystals may be placed on bedrock and obsidian, if the two blocks above the bedrock or obsidian block are air or replaceable blocks and no other entities intersect the area. If a crystal is placed on each of the four sides of the end exit portal, the crystals will respawn the healing crystals and the dragon before exploding. Beetroots can be used to breed pigs by tapping and holding one with a beetroot in your hand. Pigs will also follow the player, if holding a beetroot. Beetroots can be eaten to restore 1 hunger and 1.2 hunger saturation. Beetroot soup can be eaten to restore 6 hunger and 7.2 hunger saturation. Spectral arrows imbues the glowing effect for 10 seconds. The glowing effect creates an outline of the target, which is visible through blocks and colored based on the targets team (default is white). If a bow is enchanted with Infinity, spectral arrows will still be consumed. Ingredients: Glowstone Dust + Arrow. Tipped arrows imbue a status effect when hitting a mob or player. The duration of the effect is 1/8 that of the corresponding potion, and is not affected by the power of the arrow. The effect is the same as the regular power effect for the potion. If a bow is enchanted with Infinity, tipped arrows will still be consumed. Ingredients: Any Lingering Potion + Arrow. This is all the new crafting recipes in the new version of Minecraft. We have not covered all new items or blocks, just the crafting recipes.